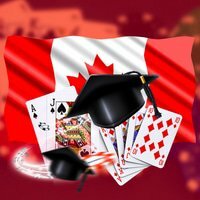 Canadian Poker School with Free Sport Tips! Most Canadians are fond of playing poker. Taking a heed of its many benefits influences anyone to learn more about this game. Everyone wants to win the game of poker as it can change a person's life in no time. It is believed that the most successful players are the ones with greater knowledge and skills. It makes sense then that some poker enthusiasts engaged themselves in advanced training and technical poker lessons in which they may obtain from a Canadian Poker School. Poker players and enthusiasts can enroll themselves in land-based Canadian Poker School or even online. It should come as no surprise that most of them have something in common; they are all vying for the "pro" status. By playing in tournaments and practising different poker variations, students will also discover the skill and dedication that is behind this sport. It's no secret that poker is legal in Canada, and this notion had opened a lot of possibilities. Poker can be a game of chance but it's more of a skill-oriented form of entertainment and being able to sit on the poker table with proper knowledge and skills, you will have a greater chance of beating your opponents. This game also involves willpower, enthusiasm and patience. The University of Waterloo in Canada has produced the biggest group of world-class poker players. Among them is Mike "Timex" Mc Donald who won $1 million in an EPT major event. Steve Paul-Ambrose, Glen Chorny, Xuan Liu, Matt "Choppy" Kay, Scott Montgomery came from Waterloo as well. There are other poker schools in other parts of the world, particularly in the USA and Europe. Although land-based schools have greater benefits, there are also online Canadian poker schools which provide the same level of standards. Generally, these schools offer a wide range of options which are not available on land-based schools. They offer free tips and provide unlimited information to their students and to all poker fans.